It's bad enough that some lions lurk in trees now a new study says that crocodiles can climb trees as well. Which is a little surprising since crocodiles don't have the anatomy associated with tree climbing ability. Crap! Lions are in trees too. 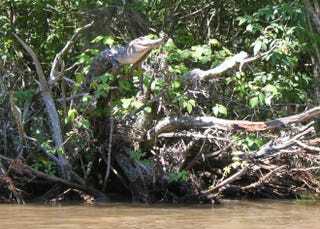 Overall, the team found crocodiles in trees, day and night, pretty much everywhere they looked. They suggest the behavior exists as a means for regulating body temperature and surveying the environment. But the crocodiles are skittish — most promptly fell off their logs or dove into the water as observers approached. You can read the pdf report here.